Joe Rigney is definitely a disciple of John Piper. The renown pastor’s influence oozes forth from the pages of Rigney’s latest book The Things of Earth. Yet, The Things of Earth is not simply Desiring God 2.0. 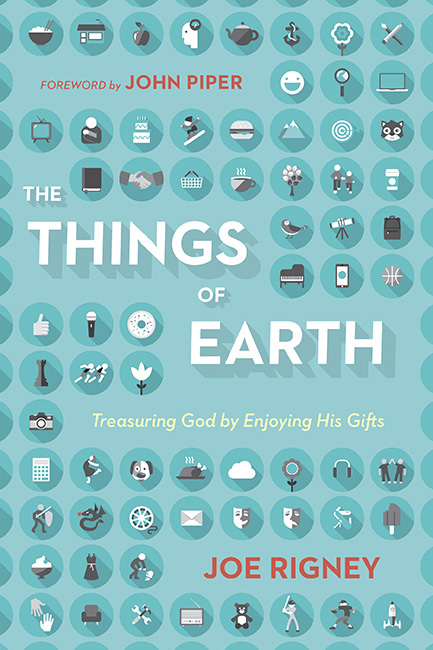 Within its pages Rigney applies Piper’s Christian Hedonism theology to a new area of the Christian life, namely the things of earth. This is a highly creative work that helps readers to love God through loving the things of earth. Much like Michael Wittmer’s Worldly Saints, Rigney recognizes the angst that many Christians have with their own love of “earthly things.” We love coffee, playing at the beach, good music, funny television shows, and a great pair of running shoes. Yet these are “less spiritual” things, and therefore we feel a sense of guilt for loving them as much as we do. Rigney, like Wittmer, identifies this as false guilt and aims to help us resolve the tension in our own minds and hearts. Rigney believes that our enjoyment of earthly things, like pumpkin crunch cake, is actually an enjoyment of the glory of God in all his Trinitarian fullness. God communicates this Trinitarian fullness, and invites us into it, through the created world. His glory, then, is seen and experienced in the world He has made, in things like honey. Tasting the sweetness of honey can lead us to “taste and see that the Lord is good.” He develops these arguments by means of highly creative theological work. Influenced by Piper and, naturally, by Jonathan Edwards he brings us to conclusions similar to Wittmer but by different means. This leads Rigney to conclude that creation is a means of communicating the divine, and as we enjoy the world we can enjoy God. In addition to developing an encouraging look at the spiritual joys of created and cultured life on earth, Rigney also responds to important criticisms. He explores the issues of idolatry and suffering, and addresses the priority of loving God. He leaves no stones unturned in this 235 page work. There’s much to love about this book. It develops a very full theology of earthly joy. If Wittmer’s book is more accessible, Rigney’s is more foundational. He provides lots of solid footing for the development of this theology. Even while I don’t agree with Edwards’ explanation of the Trinity, a major lens through which the author explores both the Trinity and God’s relation to the world, I still found much worthwhile in this creative work. He interacts with a lot of voices and ideas, and offers some particularly insightful nuances to common arguments from Piper and C.S. Lewis. This is a highly creative work with a great deal of depth and imagination. I highly recommend The Things of Earth. In conjunction with Michael Wittmer’s Worldly Saints, readers will gain great relief to false guilt and great encouragement to enjoy earthly things for God’s glory.